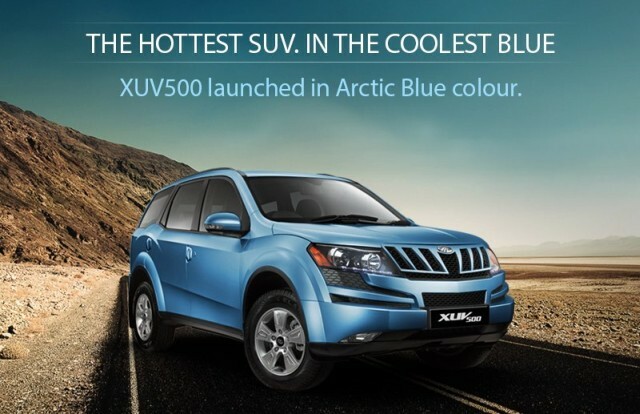 Mahindra has added another color - Arctic blue to its exisitng range of 6 colors. The Mahindra XUV 500 has been one of the most successful SUVs in recent times from Mahindra. It is sold with a starting price of INR 11.7 lakhs with the top end all wheel drive version carrying a price tag of INR 14.5 lakhs. The SUV recently crossed sales of 50,000 units in just 16 months. The new Arctic Blue colour of the XUV 500 is said to be aimed at a particular age group of buyers. The XUV 500 is already being sold in six exterior colours - Volcano Black, Satin White, Moondust Silver, Tuscan Red, Opulent Purple and Dolphin Grey.